One of the globally recognized and premier knowledge institutions specializing exclusively in the healthcare sector of the country, IIHMR University, is inviting application for a 3 year Ph. D Programme. The areas of research for the doctoral programme include— public health; pharmaceutical management; health and hospital management; nursing management; population and development; health economics and finance; rural and urban health; health communication and behavioural change; information technology in the health sector; food security and nutrition and rural development. The Program has a total intake of 30 students (Part time as well as full time). The minimum programme duration is three years including period of registration. The registration in Ph.D depends on the subject to passing qualifying examination which will be based on the course work in the first year of the programme. The maximum period allowed to complete Ph. D is six years. The course is designed to enable the students to enhance the research competency and skills of postgraduates, researchers, academicians, teachers and mid-career professionals in private and Government health sectors. The eligible candidates for admission to the Ph D. programme should have a Master's degree or a professional degree declared equivalent to the Master’s or M Phil degree by the corresponding statutory regulatory body, with at least 55% marks in aggregate or its equivalent grade 'B' in the UGC 7-point scale (or an equivalent grade in a point scale wherever grading system is followed) or an equivalent degree from a foreign educational Institution accredited by an Assessment and Accreditation Agency which is approved, recognized or authorized by an authority, established or incorporated under a law in its home country or any other statutory authority in that country for the purpose of assessing, accrediting or assuring quality and standards of educational institutions. The admission process will include three steps: screening of applications, IIHMR Research Aptitude Test (IRAT) and personal interview. The IIHMR University will conduct a qualifying test after screening of applications and short-listing candidates. IRAT will be a written test consisting of multiple choice questions from English language proficiency, reasoning, basic quantitative analysis and research aptitude. UGC CSIR qualified JRF & NET, SLET, GATE and Teacher Fellowship holder and have passed M Phil programme in relevant subjects are categories which will be exempted from writing the IRAT.Personal interview will be conducted on the day of IRAT or next day after IRAT at the IIHMR University, Jaipur. All categories of candidates will be required to appear in the Pl. At the time of interview the candidates are required to discuss their research interest/area through a presentation. 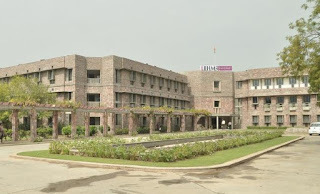 IIHMR University is a leading knowledge institution of the country engaged in teaching, research and training in the domains of public health, health and hospital administration, pharmaceutical management and development studies.Set up in 1984, IIHMRbecame a university in 2014. Over the past thirty-fiveyears IIHMR has carved a niche for itself among management institutions, both in India and abroad. The institute is the World Health Organization’s Collaborating Center for strengthening Health Systems based on Primary Care and is termed as an ‘Institute of Excellence’ by the Government of India’s Ministry of Health and FamilyWelfare. IIHMR has already conducted more than 500 research projects and studies on the health, social and developmental systems and policies in India and wider South-East Asian Region.